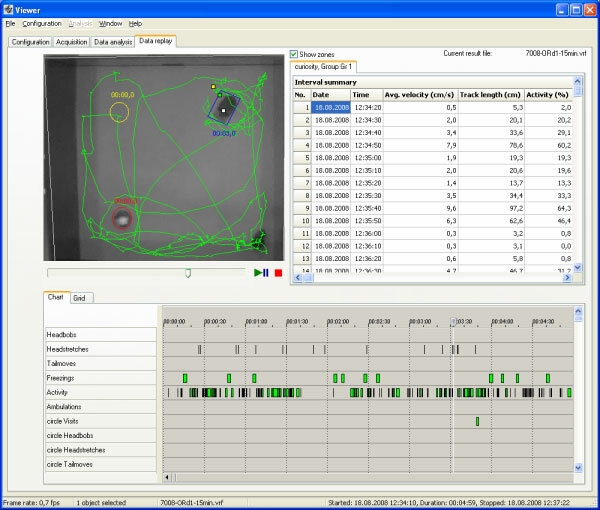 The Data replay interface offers valuable insight into acquired data. It is especially helpful in finding best behavior recognition settings and to investigate on special events in long lasting experiments. In contrast to the Data analysis tab, here result presentation is focused on the time line, not on statistics visualiza­tion. There are two ways to navigate through the experiment. First, you can replay the video by using the video slide ruler, the play, pause and stop button. According to the video position, the ruler in the ethogram below moves. So you can evaluate how good behavior detection matches the behaviors you see. The other way round you can drag the ruler in the ethogram to a detected behavior to jump to the respective scene in the video instantly.